Scarlet fever, caused by group A strep infection, was once a potentially fatal childhood disease, but now it is possible to treat it. Your doctor may order a test for strep if your child has a rash and sore throat. The treatment option involves giving your child antibiotics to avoid any long-term health problems. Keep reading to learn more about scarlet fever in children and some ways to protect your child from developing it in the first place. What Is Scarlet Fever in Children? Scarlet fever is a complication associated with strep throat. Caused by the same group of bacteria that are responsible for causing strep throat, scarlet fever or scarlatina usually affects children between 5 and 15 years of age. 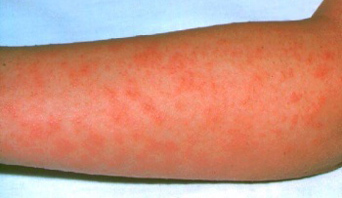 Scarlet fever in children will cause a bright red rash with a sore throat and high fever. 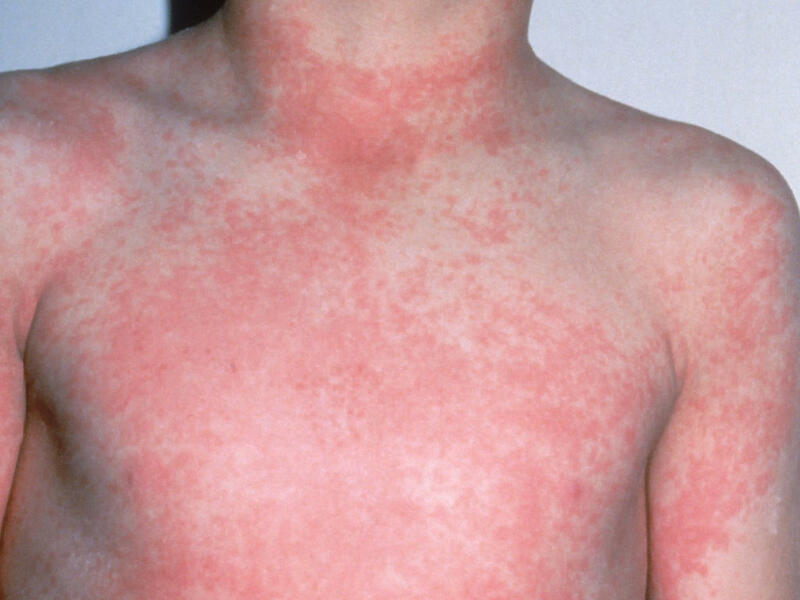 The red rash is the typical symptom of scarlet fever; in fact, it gets its name from the red rash. 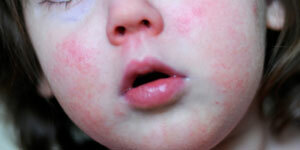 Red rash: Your child will develop red rash that will look more like sunburn. It usually appears on the face first and then spreads to the arms, trunk and legs. The red rash will turn pale if you apply pressure to it. Red lines: You will notice the folds of skin around armpits, groin, knees, elbows and neck become deep red as compared to the surrounding rash. Flushed face: In addition to rashes, you may also notice the face of your child appear flushed. There may also be a pale ring around their mouth. Strawberry tongue: The tongue of your child will look bumpy and with a white coating early in the disease – the tongue will look red once the disease progresses. It may take about a week for redness to go away, but it is followed by the peeling off of the affected skin. Other common signs include fever in excess of 101 °F, difficulty swallowing, very sore throat with white patches, nausea, enlarged glands in the neck,and headache. You need to see your doctor immediately if your child has a sore throat with a red rash, swollen glands in the neck, and a fever higher than 102 °F. Yes, it is. The incubation period for scarlet fever can be anywhere between 12 hours and a week. Your child is contagious during the incubation period as well as during the acute illness. It means that the disease is contagious even when you don't notice any symptoms yet. However, the strep infection is contagious, the rash isn't. Research shows that about 80% of children develop immunity against the streptococcus exotoxin once they reach age 10. Your doctor can diagnose scarlet fever by examining your child and looking for certain physical symptoms such as a rash, sore throat or red tongue. If they suspect your child has the strep bacteria, they will swab the back of your child's throat to collect a sample for testing. Since a number of conditions can lead to scarlet fever, it is important to perform a test to identify the right treatment. Sometimes, no strep bacteria are found in the test, which means your child has another illness that's causing a sore throat. Once it is confirmed that your child has scarlet fever, your doctor will then identify the most appropriate treatment option to deal with the specific symptoms and the test results of your child. Here are some specific treatment options used to treat scarlet fever in children. As bacteria cause scarlet fever, your child will benefit from antibiotics. These antibiotics are usually quite effective against GABHS (group A beta-hemolytic streptococci). Your child may have to take an oral penicillin medication for the first 10 days. In rare cases, patients require a single injection of penicillin G benzathine. An injection is usually a better choice in patients who cannot retain oral antibiotics. Some other antibiotics from the family of the cephalosporin may also prove effective for scarlet fever in children. Even if GABHS is resistant to some antibiotics, the use will help prevent complications such as rheumatic fever. Just keep in mind that not all antibiotics are appropriate for children, so only use antibiotics as per your doctor's instructions. While antibiotics will help clear the infection, you can also take some home-care measures to minimize the discomfort. It is difficult for your child to eat and swallow anything due to a strep throat, so you should switch to a liquid diet instead. Give your child warm nutritious soups and soothing teas – cool soft drinks and popsicles will also work. Be sure to give your child plenty of fluids to prevent dehydration. You can also give OTC pain relievers such as ibuprofen or acetaminophen to alleviate throat pain. Keep your child's fingernails trimmed or they will damage their skin while scratching the rash. Use an OTC anti-itch medicine to relieve itching. It is not easy to see your child in pain due to the symptoms caused by scarlet fever. Therefore, it is best to take some preventive measures to protect your child from getting infected. Early diagnosis will really help reduce the chances of complications, but you should also take steps to ensure that your child doesn't get exposed to group A streptococcal infection. Don't let them get in touch with someone who is diagnosed with strep throat. Also, you should not send your child to school if they are infected. This will save other kids from becoming infected. You should also teach your children good hygiene practices and tell them to wash their hands frequently and don't share their eating utensils with others. Why Does It Feel Like There’s Water in Your Ear?